In celebration of the Montreux Jazz Festival’s 50th anniversary in Switzerland, Jeep have created three customised show cars designed by Garage Italia Customs. 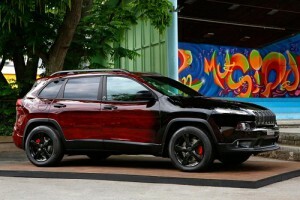 The Cherokee, Renegade and the Grand Cherokee where chosen, each inspired by a musical theme. The festival opened to the public on 1 July, and visitors will have the opportunity to see the unique Jeep models close up at the various festival sites up until the event ends on 16 July. The Grand Cherokee ‘Score’ uses the 75th anniversary edition model as a base which has a 3.0 litre engine. It features a musical score design in special paint work with a shiny brass effect, and the same design is continued in the interior. The Cherokee ‘Jazz’ was inspired by the guitar. A wood veneer effect has been created on the body work. Inside, the seats are upholstered in Foglizzo leather, the same material used in all three special edition models. 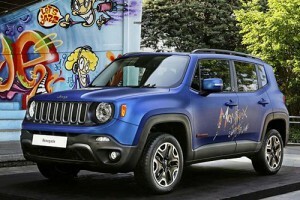 The Renegade ‘Vinyl’ has been based on the Trailhawk model with a 2.0-litre, 170 HP Multijet II turbo diesel engine. It was produced with a 3D-effect double-wrap to create a tactile ‘microgroove’ vinyl look. 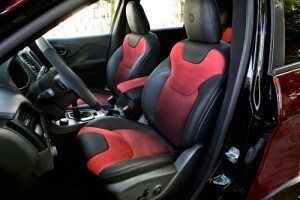 The vinyl design is continued inside on the Alcantara and leather seats.